This issue ties in with the giant, companywide crossover <Infinity at Marvel, which is basically just another alien invasion of Earth, this time by Thanos and his army. Seeing as how a decent portion of the Guardians of the Galaxy have rather personal ties to Thanos and/or Earth, obviously they are going to want to do something about this. At first, however, they don’t know exactly for sure what they’re going to do. During the opening scene, Gamora gets angry at Peter Quill for not instantly flying off to Earth to fight stuff. Then, they are interrupted by a message from Abigail Brand of S.W.O.R.D., asking for help, and Quill decides that’s a good enough mission for them to get into this crossover. Gamora then immediately gets angry that they are now instantly flying off to Earth to fight stuff. Not the most consistent characterization this issue. The art is by Francesco Francavilla, and his style is one of those love it or hate it things. Except that’s not true, because I neither love nor hate it myself, but it has a limited color palette, which often seems to be trying for the color the scene “feels” like rather than the color a scene actually is. 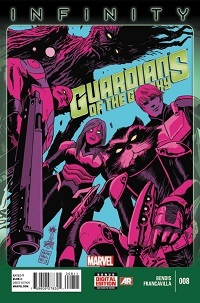 For instance, you might have noticed all the Guardians are purple on the cover. This is it; after years of ignoring these two characters, who started off in the original TMNT cartoon series, they finally return to TMNT. They were basically two loveable oafs, big and strong but basically too stupid to be anything close to a threat, with an endearing loyalty to their Foot masters. Of course, this is a much more serious take on the TMNT; this isn’t just a kid’s Saturday morning toy commercial. They actually need to be serious threats. 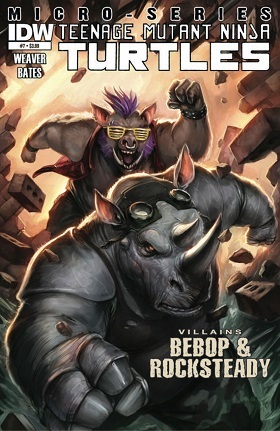 The reason this reintroduction of the characters works is because the new Bebop and Rocksteady are credible threats, partially because they are big, stupid and stupidly loyal oafs. They’re the two guys who are kicked out of every gang for being stupid, so when they become giant, unstoppable mutants, even when Karai decides they’re too stupid to live and sends a ninja team to take them out, they are still loyal to her, because she’s all they’ve got. And she, in turn, can’t help but be pleased that, stupid idiots or not, they can still take out entire ninja teams almost accidentally, they’re that unstoppable. They are both still oddly loveable, but they are now, for the first time, also a little bit scary. Ben Bates does the art for this issue, and it is pretty spectacular. He brings out the humor of these two characters, but also has dark, spiky moments that help sell the fear. One two page spread of carnage instantly sells the fact that these two are monsters. Speaking of monsters, here comes the scariest monster of all. He’s also had his goofy cartoon incarnation, and he’s been killed off before, but he keeps coming back. In this issue, Kitsune wonders why he doesn’t like to talk about his literal resurrection in this version. I mean, because he’s usually such a loquacious guy. 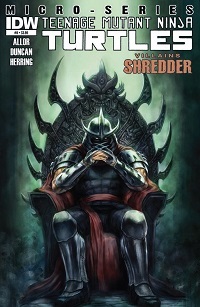 It turns out Shredder is haunted by dreams of the time he was dead, waiting to be resurrected. He remembers his time in the afterlife, or a version of the afterlife. A demon tells him they can’t take his soul from him, but that he may give it to them, if he isn’t careful. Also, don’t disturb the peace of the other spirits. Given both his nature, and the nature of these types of stories, he doesn’t take the demon’s advice. Bad idea, as it turns out. It’s short, simple story that turns on a twist; it almost makes you sorry for the guy. But not really; it was his own darn fault for being so darn evil. Hey, didn’t this mini-series start with an alien brain’s adventure in Dimension X? Boy, this series took some turns. But most of the issues have held up remarkably well; they both garner a little sympathy for the turtle’s devils, while also making each of the characters a bit scarier in the end. For anyone who loves the TMNT series - definitely check out the 2011 series that the Villain series is a part of, some fantastic storytelling there. If you want great fighting sequences with mutants and especially Bebop & Rocksteady check out issues 39 and 40 of that series. 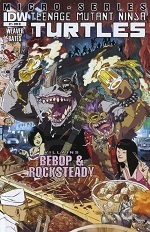 Rock and the Bopster may still be about as dumb as their previous incarnations (such as the eighties toon) but in this series they're no pushovers when it comes to fighting.